PIKETON, Ohio – Ohio needs more fish farmers, and researchers at the Ohio Center for Aquaculture Research and Development are working to meet that need. 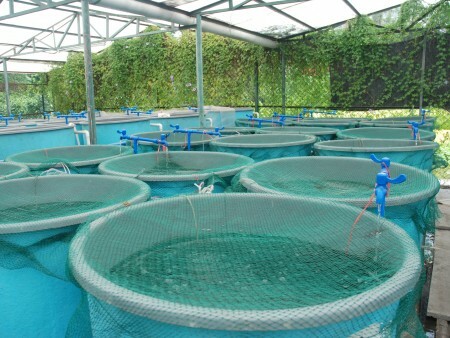 The center will offer a daylong introductory workshop on aquaculture and aquaponics Oct. 29 from 8 a.m. to 4 p.m.
Aquaculture is the breeding, rearing and harvesting of aquatic plants and animals in a natural or controlled environment, Smith said. The workshop is presented by the Ohio Aquaculture Association, Ohio’s trade association for aquaculture and aquaponic producers, in partnership with OSU Extension and OSU South Centers. OSU Extension is the outreach arm of the College of Food, Agricultural, and Environmental Sciences at The Ohio State University. The South Centers also are part of the college. Workshop presenters will include current aquaculture producers, industry specialists, business professionals, and OSU Extension educators and researchers. Registration is $45 per person or $75 for two people from the same farm, business or family. It includes all materials, refreshments and lunch. To register, go to ohioaquaculture.org/events, email info@ohioaquaculture.org or call 614-604-8823. The deadline to register is Oct. 25.